Horákite: Mineral information, data and localities. Horákite is named after Ing. František Horák (1882–1919) served from 1916 to 1918 as bergadjunkt and the responsible head of the Radium factory in St. Joachimsthal (Jáchymov) and his grandson MUDr. (M.D.) Vladimír Horák (born 1964) is an amateur mineral collector and historian, focused on the history of mining in Jáchymov. New structure type. Quite unique with phosphate and arsenate groups occurring separately. Greenish-yellow to pale yellow prismatic crystals clustering to acicular aggregates, up to 1 mm across. Plášil, J., Kampf, A.R., Sejkora, J., Čejka, J., Škoda, R., Tvrdý, J. (2018): Horákite, a new hydrated bismuth uranyl-arsenate-phosphate mineral from Jáchymov (Czech Republic) with a unique uranyl-anion topology. Journal of Geosciences, 63: 265-276. Plášil, J., Kampf, A.R., Sejkora, J., Škoda, R. and Tvrdý, J. (2017) Horákite, IMA 2017-033. CNMNC Newsletter No. 38, August 2017, page 1036; Mineralogical Magazine: 81: 1033–1038. Plášil, J., Kampf, A.R., Sejkora, J., Škoda, R. and Tvrdý, J. (2017) Horákite, IMA 2017-033. CNMNC Newsletter No. 38, August 2017, page 1036; Mineralogical Magazine: 81: 1033–1038 ;Plášil, J., Kampf, A.R., Sejkora, J., Čejka, J., Škoda, R., Tvrdý, J. 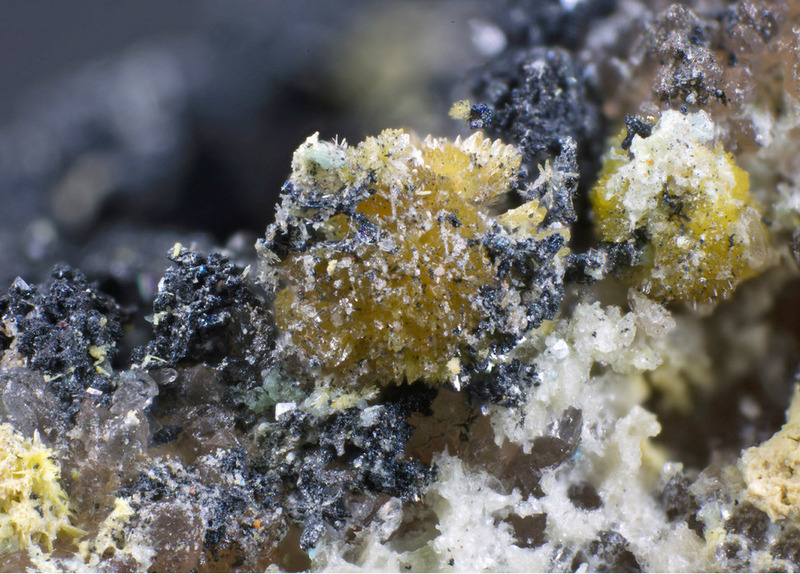 (2018): Horákite, a new hydrated bismuth uranyl-arsenate-phosphate mineral from Jáchymov (Czech Republic) with a unique uranyl-anion topology. Journal of Geosciences, 63, 265-276.